Cheerful Buttercup is a perennial herb found in damp places in the Himalayan region, at altitudes of 1500-2700 m. The species name laetus means happy, cheerful. 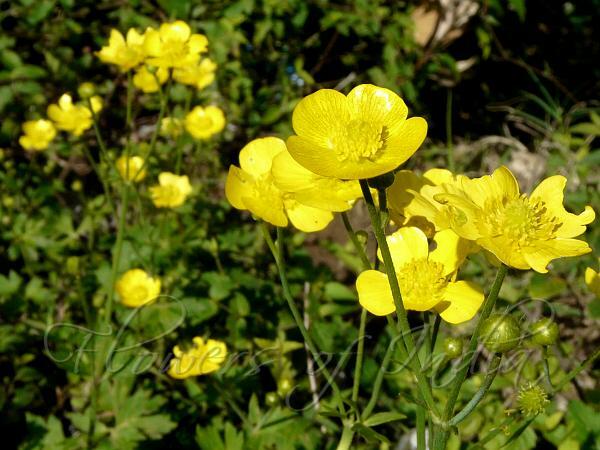 True to its name, the cheerful looking yellow buttercup flowers are carried on slender, tall, branched, branched, upright leafless branched stems. The plant grows up to 1-3 ft tall. Leaves are large, 8-12 cm, broadly rounded in outline, deeply 3-5 lobed. The lobes are inverted lance-shaped, pointed, further 3-lobed, sharply toothed and hairy. This leaf character clearly distinguishes it from Spreading Buttercup. Lower leaves have long stalks. Large glossy yellow flowers are 1.5-2 cm across. 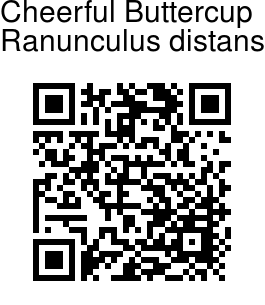 Cheerful Buttercup is found in the Himalayas, from Afghanistan to SW China, at altitudes of 1500-2700 m. Flowering: April-June. Photographed at Kempty Falls, Uttarakhand & Kashmir.